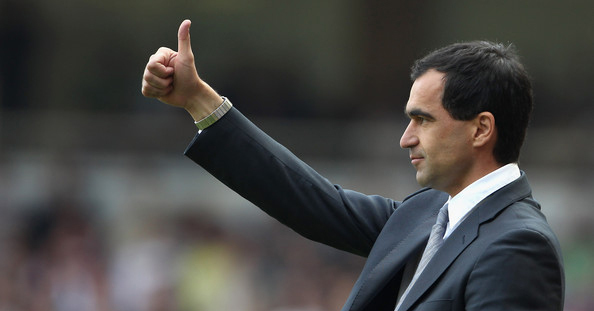 Roberto Martinez has called on his Everton squad to “embrace the rising expectations at the club” following a sensational season so far which has them as favourites with Betfair to finish the season in the top four. The Toffees recently highlighted enhanced their hopes of securing fourth place with an impressive 3-0 victory over rivals Arsenal at Goodison Park, in a result that shocked many Betfair fans and left Everton just a point behind the Gunners with a game in hand. Currently on a run of six successive wins, Everton are now favourites for fourth place with a large number of Betfair.com visitors, and the club’s timely winning run has added a level of expectation among the Goodison faithful, who are now beginning to believe they could genuinely be watching their team playing Champions League football next season. With a top-four finish now in their own hands, Martinez has insisted his side need to embrace the growing expectations surrounding the club and further shake up the previously closed shop that was the Premier League top-four. “We embrace the expectations. It’s very difficult to change the perception of which teams are going to challenge for the top four or for the title. “The Premier League is the best league in world football due to the competitive edge that it has and for us to be involved in this fight is exactly what we were looking for,” said the Everton manager. Not many Everton fans would have expected Martinez to have achieved so much during his first season in charge of the club, and the Spaniard might well further rub salt in David Moyes’ wounds by reaching the Champions League group stages and achieving something the Manchester United manager failed to do during his 11 years in the job. The below views are those of our readers and do not reflect the opinions of Premiership Talk or its employees.